Publisher: George Routledge and Sons, 1883. Part of Morley’s Universal Library. Condition: Hardcover, decorative cloth. Fair. Some wear and tanning to cover, a few annotations in pencil. Small bookseller’s sticker to endpaper. 315pp., app 7″ by 5″. The Tragical History of the Life and Death of Doctor Faustus, commonly referred to simply as Doctor Faustus, is an Elizabethan tragedy by Christopher Marlowe, based on German stories about the title character Faust. It was written sometime between 1589 and 1592, and might have been performed between 1592 and Marlowe’s death in 1593. Two different versions of the play were published in the Jacobean era, several years later. 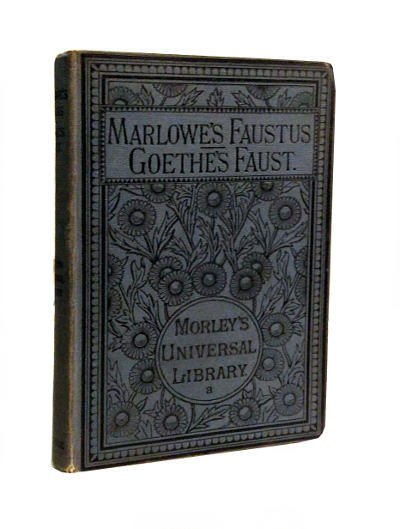 Faust is Goethe’s most famous work and considered by many to be one of the greatest works of German literature. Goethe completed a preliminary version of Part One in 1806. The 1808 publication was followed by the revised 1828–1829 edition, which was the last to be edited by Goethe himself. Prior to these appeared a partial printing in 1790 of Faust, a Fragment. The earliest forms of the work, known as the Urfaust, were developed between 1772 and 1775; however, the details of that development are no longer entirely clear. 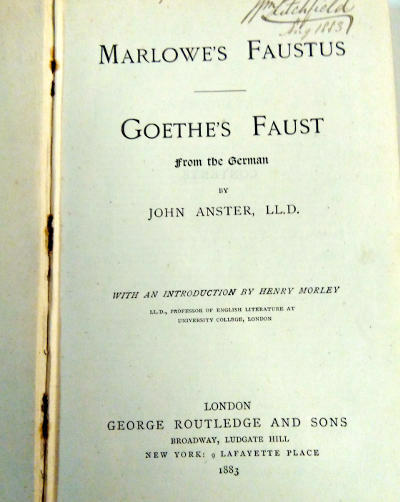 Goethe finished writing Faust Part Two in 1832, the year of his death. In contrast to Faust Part One, the focus here is no longer on the soul of Faust, which has been sold to the devil, but rather on social phenomena such as psychology, history and politics, in addition to mystical and philosophical topics. The second part formed the principal occupation of Goethe’s last years and appeared only posthumously in 1832.